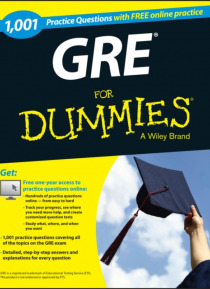 Prepare for the GRE with targeted practice and professional insight 1,001 GRE Practice Questions For Dummies is your comprehensive guide to preparing for the GRE. Our test prep gurus lead you through questions designed to parallel the Verbal Reasoning and Quantitative Reasoning sections of the exam, and provide advice and guidance for improving skills on the Analytical Writing portion of the test.… Each practice question includes the answer, along with step-by-step instruction and detailed narratives that explain the best approach. The GRE General Test is your ticket into graduate school, and solid preparation is the key to an impressive score. Whether you're coming straight out of college or have been out of school for a few years, there's a good chance you'll need to brush up on all the things you've forgotten and discover the things you didn't learn as an undergrad that graduate school will demand. Reading through your old notes and textbooks only helps so much! It's better to learn exactly what's on the test, and shape your study time around that information. This book includes a one-year subscription to online content including: Get: Free One-year access to practice questions online: Hundreds of practice questions online from easy to hard Track your progress, see where you need more help, and create customized question tests Study what, where, and when you want Detailed Answers and explanations for every question If you're studying for the GRE, nothing beats repeated practice as a way to avoid surprises on test day. You need to be fully prepared, and know exactly what to expect. 1,001 GRE Practice Questions For Dummies is the ultimate GRE prep method, with a targeted approach that will help you show what you know.